Last Saturday, the queens of the house decided to have an adventure in the City of Manila. We wanted to shoot pictures of Paco Park. We weren’t able to do that because it started raining and I didn’t want my camera to get wet. I had the Sony Nex-5 with me and unlike the Olympus 8010 tough – Sony is not waterproof. Getting out of the area means going back to Taft avenue. I can only remember the one way directions from my youth – which is 20 years ago – when I used to go to Manila Science High School on Padre Faure. So I turned right on a street – in which other cars were also turning right. Big mistake – a cop stopped us and pointed out that we entered a one way street. I didn’t argue with the cop – it was a one way street – and it was my mistake. I just asked him where I can pick up my license. He said that it can be picked up after a week from the Manila City Hall. That isn’t too inconvenient for me since I can ask one of my Aunties who work at the Manila City Court to pick it up for me. After looking at my license – he gave it back to me and he said that he will let me go this time. He noted that since we were from Sta. Ana – and a resident of the city – and I was being nice about it – he will let me go. I thanked the officer and drove off. This is actually the second time this happened to me. The first time was in Makati. The officer stopped me for beating a red light. After looking at my license – he gave it back to me. That officer also noted that I was being very nice about this – and he just reminded me to drive carefully. Most of the time – I tell myself that I’m too nice and polite. I sometimes wonder if it’s a good thing. Times like this – make me realize – being nice – works for me. I am Super Mayor in FourSquare. That means I am mayor of ten sites. FourSquare in the Philippines is not very popular. So even if I have unlocked this all important badge – I don’t have anyone to share the glory with. The best dessert in town is found at Terrace at 5th. I have already mentioned the Frozen Brazo de Mercedes in previous entries. That was my favorite pastry – till I met Coffee Panna Cotta a couple of weeks ago. It’s Panna Cotta –with the added flavor of melted coffee/caramel syrup. BusterTheBeagle: @MidoriBeagle Oops! Better Start hiding now!! MidoriBeagle: @BustertheBeagle they were worried I swallowed battery. Of course I won't. It was not yummy. BeagleStitch: @MidoriBeagle http://plixi.com/p/46880482 - Arrroooooo!!! Beagoats rule! 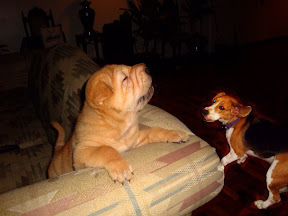 Iamabeagle: @MidoriBeagle hahahahaa. That is fantastic!! That has a beagoats signature all over it. DaisyDorg: @MidoriBeagle Beagoat of the Week looks like... Well done Midori! MidoriBeagle: @DaisyDorg thank you. ***bows*** happy to have made you all proud. Jumpnjoey16: All of @MidoriBeagle 's twitter friends are applauding her for destroying our remote control. It's the second one she destroyed. I love milk. I grew up drinking milk everyday. A couple of years ago, I stopped drinking milk but I’ve always had it in my coffee. Recently – I decided to drink Milk again. This time – my tummy seems to be rejecting it. Going through the ruins of the ancient city of Ayuthaya reminds me of a Sonnet that we studied in High School. “Ozymandias” which was written by Percy Bysshe Shelley. Ayuthaya was the capital of Thailand and it was destroyed many times because of War. Eventually the emperor of Siam ( Thailand’s old name ) transferred the capital to Bangkok. This is the Sonnet of Shelley. As you read it – you may actually be reminded of Egypt. I have not been to Egypt so the closest experience I’ve had is Ayuthaya. A day after Steve Jobs announced the new generation of iPod Touch, I ordered it from the Apple Store. This is the second time that I was ordering from the store and the first transaction (Airport Express) was so smooth that I just knew that from now on – I’d be ordering Apple products online. The original delivery estimate for the iPod Touch is October 14 – so I was pleasantly surprised when I got an e-mail from the Apple store last weekend that I’d be receiving the package this week. I monitored the Shipment tracking number and noted that my iPod Touch 4.0 is coming straight from China. Today – the package has arrived. I excitedly opened it and it seems like Char Siew was as excited as I am as he joined me in opening the box. First impressions of the product – it looks like my iPod Touch 2G – a little bit thinner. It has a front and rear camera. Everyone was raving about how thin this new iPod Touch is – but it really isn’t that much thinner. I actually wish they retained the old size so I can reuse my old case. I am also trying to see if the Retina display that comes with the iPod Touch is so much different from the 2nd Gen. Maybe it’s my poor vision – but I don’t see much difference. BTW – this is a little bit cheeky – but I named it Titanic – after a Tweet joke I read. You know – the one about naming their iPod Titanic so that when they plug it into iTunes – they can see Titanic is syncing. Bad Joke – but I’m running out of names for my iPod and iPad ( I have one iPod classic, iPod Touch Gen 2, iPad, and this one iPod Touch Gen 4 ). I have yet to play with it – as soon as I do that – I’d post another entry of what I think. As soon as I bought the iPad, among the first applications I looked for are Photo Editing apps. On the desktop, I actually use Picasa for most of my basic editing. It’s free – which makes it the best choice for what I need it to be. However – there are just some editing that Picasa can not fulfill – and I wasn’t willing to spend for the Adobe Photoshop. The last time I checked – Photoshop cost at least 70 USD. This is where the iPad comes in. Those who own an iPod Touch, the iPhone and the iPad – knows that the Apple App store is filled with hundreds of thousands of applications that are very reasonably priced. Developing an App for the iOS devices has become the cottage industry of this generation. For Photo Editing – I have found and tried half a dozen of them. The first two applications I downloaded are Filterstorm and Camerabag. Both of these apps cost 2.99 USD. Camerabag allows one to choose form 6 different filters. it’s simplistic and provides the user a vintage feel for their pictures. Filterstorm – was great – but when I first downloaded it – I felt that it was too complicated and I didn’t know how to use it. Little did I know – that if I was just going to be patient – Filterstorm is actually the closest that I can have to having Photoshop on my iPad. I then continued to download other apps. The next ones that I bought were Colorsplash (1.99 USD) which allowed me to have localized colors to a predominantly black and white photo. Tiltshift Generator (2.99 USD) allowed me to highlight portions of the photo by having artificially applying Gaussian Blur onto the photo. Masque ( 3.99 USD ) allowed me to have multiple effects to the photos – like increased saturation, Gaussian Blur – and colorsplash effects. I thought I found the perfect app with Masque. The problem that I had with Masque is that it doesn’t allow me to zoom into the picture which makes the application of some effects on detailed corners of some figures very difficult. So I looked one last time and found PhotoWizard (0.99 USD). it does almost all of what Masque does and more. And this time – I can zoom into the picture for the details. The problem I found with PhotoWizard is that it saves the picture in a very small resolution because it only has an iPhone version. So I thought that the only way that I can successfully edit a photo is by combining the capabilities of all of these applications. Then I decided to revisit Filterstorm. If you’d recall – I thought it was too complicated and one of the things I failed to explore is applying effects ( all of those I mentioned above ) – and applying them to local masks. I was thrilled. Everything that Colorsplash, Masque and PhotoWizard can do – Filterstorm can do – and in a decent resolution. Moreover – the CLONE feature allows me to paint over unwanted portions of the picture ( for example the leash of the dogs in their pictures ). So I guess – I found the perfect Picture Editing software and that is Filterstorm. I hope that people who read this entry – can learn from my journey. If you have a newly bought iPad --- I recommend downloading Filterstorm. IMO – it is the only photo editing software you need on the iPad. When we did the “My Manila Weekend” with Carlos Celdran, I bought two books as souvenir: the English translation of “Noli me Tangere” and “El Filibusterismo”. This was a translation done by Ma. Soledad Lacson-Locsin. The last time I read Noli and El Fili was in High School. It’s required High School reading for the Philippine schools. I must admit that the beauty of Rizal’s books were lost on my feeble mind. I was thinking that maybe if I read it now – as an adult – I can finally understand what it’s all about. I wasn’t disappointed. Reading – it in English also helps. “A man who did not invent gunpowder,” added Laruja. “A Franciscan! Well, this one could have been a missionary in China, this Padre Savalls,” replied the lady who did not easily give up on her own views. “Madam, you must be meaning Schwartz,” replied Padre Sibyla without looking at her. “Well! Savalls or Chevas – what does it matter? One Letter does not make him Chinese,” replied the Franciscan with ill humor. “And it was in the 14th century and not in the 7th,” added the Dominican in a condescending tone, as if to mortify the other’s pride. Three weeks ago, a new neighbor moved in. It’s a restaurant which is located across from where Seattle’s Best Valero is. I am not sure if this is the third restaurant which took over that space in the last three years – but judging from our experience in that restaurant for Dinner last night – I think this may actually stay a lot longer than it’s predecessors. The name of the restaurant is Relish. We decided to try it out since the House of Queens has a guest from Singapore and we thought that it’s best to stay really close to the house so we can get back to the house as quickly as possible to catch up with each others’ lives. Our Singapore guest – decided to order the house white wine – and I ordered the house red wine. I had three glasses – which I regret today since it gave me a bad hangover. For dinner, we ordered the Spinach Artichoke dip, the spring salad, and the pork belly barbecue. All of the dishes were cooked really well. I would dare say that this is the best spinach artichoke dip in town. So if you find yourself in the Salcedo Village area – especially if you work or live in the area – I totally recommend trying out Relish. It’s on Valero st – right across from where Seattle’s Best is located. I used to be bewildered whenever I see friends freak out when their children show the slightest symptom of sickness. Lately – I realized that with my pets – my reaction is actually worse than what I’ve seen with my friends before. The problem with dogs is that they don’t talk nor do they cry. The only thing that you can do to identify if there’s something wrong with them is by observing their behaviors. If they don’t eat, or they sleep too often, or they throw up – that’s the only time that you can suspect that they are sick. Yesterday afternoon, when I woke up, Midori’s Nanny said that Midori was sick and she tried knocking on our room but I did not wake up. Thankfully – it was just another one of those times when Midori ate something ( most probably a cockroach ) – and she just had to throw it all up. However – I get pictures in my head of dogs’ stomach twisting the same way that Marley ( from that movie ) did before he died. So in the past – I will rush Midori to the vet whenever this happens. As I said – thankfully – this time what happened to Midori wasn’t serious. By the time I woke up – Midori was back to her usual behavior – the Female dog of the house of queens. She was ready to show everyone that she is top dog ( even if she’s not ). I wore glasses between the age of seven and eighteen. That’s over a decade of wearing glasses. At eighteen – I got contact lenses. I rarely wore glasses after that. A month ago – I noticed that wearing contact lenses caused some irritation on my eyes. I saw an ophthalmologist – and he gave me prescription for allergy. I was happy to hear that I had allergies and not corneal ulcer which some of my friends experienced previously. So that’s the good news. The not so good news is that I am going to be wearing glasses for three weeks – even longer if my allergic reaction to the contact lenses do not go away. My main problem in wearing glasses is that they are heavy. My prescription is high and even if I have the so called ultra thin lenses – they’re till thick and heavy. There is a tendency for my glasses to slide down my nose. I needed a solution to keep that from happening. Apparently – there are sports bands that can solve this issue. So I bought a couple of them. Apart from the occasional fogging of the glasses – with the help of the sports band to keep the spectacles in place, I’ve gotten used to wearing eye glasses again. I have quit smoking. It’s not my first time to quit. 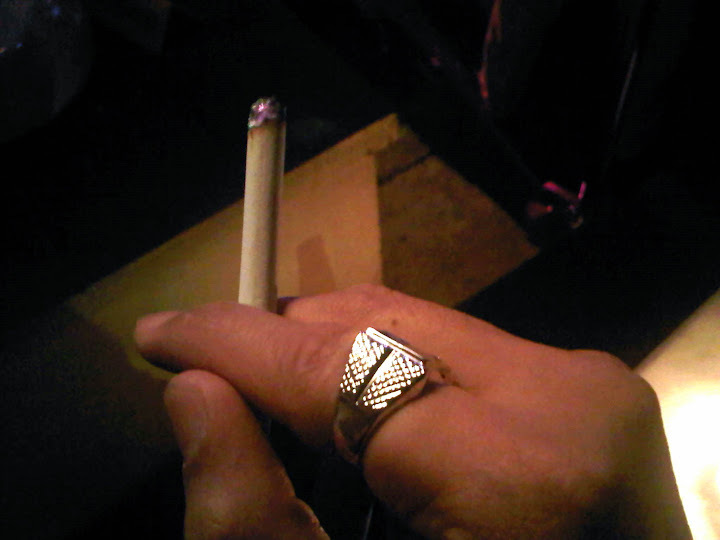 I have had periods of being a non-smoker before. I have always relapsed. This time – I’m hoping that I will continue to be Nicotine free. I have written about Masque in a previous entry. It's an iPad application which allows the user to paint effects to portions of the picture. The effects vary from blur, saturation, bright, dark, contrast and black and white effects. Unlike other applications, thr effects can be painted over specific areas of the picture. I have used the "brighten" effect on two pictures. The first one is a picture of myself with a bright background rendering my face as dark as an apparition. The second picture has the foreground image of Char Siew bright but with Midori in the background, Midori could not be seen. These are the before and after pictures of Masque magic.